Miss Giddens (Deborah Kerr), a governess, is hired by a rich man (Michael Redgrave) to take care of his orphaned niece and nephew in a secluded country estate in Bly. She loves children so despite her initial reservations, it is her first assignment after all, she is optimistic that the experience will be rewarding. Flora (Pamela Franklin) and Miles (Martin Stephens) are siblings with a lot of spirit. They are welcoming to their new caretaker, they do what they are asked, and they have a maturity about them that is uncommon for their age. Over time, however, Miss Giddens suspects that something is not quite right about the children, that their pleasant disposition serves merely as a cloak to hide something sinister. Based on the novel “The Turn of the Screw” by Henry James, “The Innocents” can be interpreted as a ghost story or a case of a woman on the verge of insanity. Either way, there is true horror in the mansion, a place that seems to have a thousand rooms but is inhabited only by a half a dozen people. 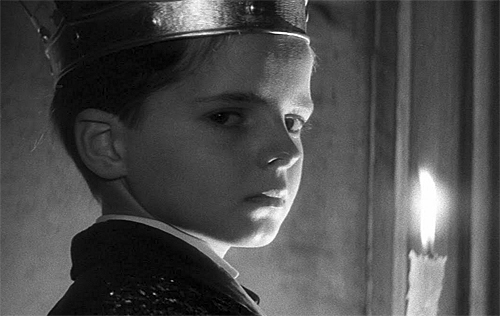 From the moment the new governess steps inside, the screenplay by William Archibald and Truman Capote hints at the possibility of a mysterious evil lurking within. When Miss Giddens asks Flora about the state of the house at night, the child claims that the rooms tend to get bigger in the dark and she enjoys being in her bed watching the darkness. Glee is in her voice when she confesses that Mrs. Grose (Megs Jenkins), the housekeeper, always keeps her eyes shut in the dark. As secrets slowly seep to the surface, Miss Giddens starts to see more than she is supposed to. She sees a man (Peter Wyngarde) on the tower. She sees a woman (Clytie Jessop) across the lake. When she describes to Mrs. Grose what she has encountered, the housekeeper turns as white as the marble floors she maintains. The figures she claims to have seen are long dead. They were former servants of the house. Scenes that lead up to scares are directed with patience and calculation by Jack Clayton. The scary moments have a pattern to them: the strange, the false alarm, and the terror. One of the most electrifying sequences involves Miss Giddens, Miles, and Flora playing hide and seek. While looking for the children, Miss Giddens sees a woman across the hallway looking solemn. She pays no attention; she assumes the woman is one of the servants. But aren’t the servants already in their quarters that time of night? Eventually, Miss Giddens reaches the attic and browses through old pictures of former inhabitants. Miles comes jumping out of the cabinet like a wild animal. Kids like to scare adults because it makes them feel like they’re in power even for just a moment. Then, when it is the governess’ turn to hide, she runs downstairs and hides behind the curtains. To her right she sees a person behind the glass doors: a man with the intention entering the premises.